When the first Gears of War released both to critical acclaim and tremendous sales, Microsoft knew they had something special on their hands. A sequel was inevitable, and we’d only have to wait two years for it. By this point, the series’ template had already spread to multiple genres; horror with Dead Space, even role-playing with Mass Effect. Gears 2 faced some stiff competition, but still stands as perhaps the best all-around Xbox 360 title ever. 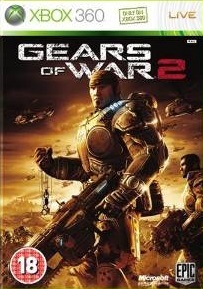 Whether playing solo, cooperatively or online, Gears 2 is simply outstanding. While at first glance this may seem like a simple retread, Epic has made some notable tweaks. Not only has the original repertoire of weapons been completely rebalanced, but several exciting new guns have been added. The Gorgon Pistol offers a sub-fire alternative, a Mortar Cannon allows you to take out multiple enemies at once, the Chain Gun presents power over speed and the Flamethrower adds another satisfying gun to the line-up. There’s also the addition of the Ink grenade, which instead of causing an instant explosion, damages gradually over time. These new weapons add a great deal of variety to Gears 2, some of which have become iconic to the series. They all feel like worthwhile additions. There’s also some other tweaks, such as being able to stick grenades to the wall like proximity traps and picking up downed enemies as meatshields, which refine and improve the original. It’s really the improved design of the modes which makes Gears 2 near-perfect, though. The campaign continues on from the first game, as the Lightmass bomb detonated by the COG causes emulsion to leak to the surface and disease to spread. And despite their efforts, the Locust seem to have risen again as cities start to disappear. So it’s up to Delta squad – once again consisting of Marcus, Dom, Baird and Cole – to stop this from happening. While the first game was more macho than emotional, Gears 2 takes some notable steps towards maturity. Characters feel more fleshed out, thanks to motion-scanning in cutscenes. Some incredible sub-plots rear their head, such as Dom’s search for his wife, while the addition of new characters such as the Texan Dizzy and the spiritual warrior Tai, all feel welcome. But it’s not just the story which sees improvement. While Gears of War had some genuinely exciting sequences, Gears 2 really ups the ante. For 360 gamers, some of the set-pieces have become iconic; a disgusting trek through a giant worm which involves chainsawing through its stomach, intense battles in multi-layered levels and exciting vehicle sections really keep you on the edge of your seat and even riding a Brumak near the game’s climax. But the pacing also integrates some well-placed quiet time, whether it’s getting a deeper understanding of the characters, exploring areas and solving some light puzzles. It’s one of the best shooting campaigns in the seventh gen.
And like before, co-op is fully integrated. Two players can take on this beast, with the additions of drop-in/drop-out and individual difficulties only improving it. But there’s also a fully-featured co-op mode which, like Gears itself, would set a trend for the generation: Horde. The concept is simple, as you progress through waves of increasing difficulty while trying to survive with up to five players. Though simple in concept, it’s truly one of the best co-operative modes, tasking you to work as a collective unit while improvising defence through shield placement and weapon choice. You may find yourself spending dozen of hours in this one, and never does it become dull with many maps to choose from – both old and new – and five difficulties with insane in particular testing your skills to the limit. It’s a treat. Finally, multiplayer completes the set. Along with the first game’s modes, several others have been added. Guardian tasks you with eliminating the team’s leader to remove respawns and Wingman splits teams into twos, among others. There’s also the smart implementation of Halo-styled matchmaking, where Bots can be substituted in place of human players and players also earn levels and unlocks based on their skill. It’s just generally a better package, with server refinement and necessary improvements to keep Gears relevant with the competition. It’s one of the best multiplayer experiences around. Gears of War set the benchmark for graphics, and arguably started an engine trend which lasted the whole generation. Gears 2 improves nonetheless, mainly adding colour. While the original came off a bit grey in spots, environments and characters sport more colour variety. Cut-scenes look more natural thanks to motion capture, and other features such as dynamic shadows, increased amounts of enemies on-screen and tweaked physics up the ante. The only downers are some mild texture pop-in and frame rate jitters. The audio is great too, featuring another superbly bombastic soundtrack, great voice acting which heightens the emotional depth of these characters and satisfying sound effects which add potency to the guns. In terms of sequels, Gears of War 2 will stand as one of the finest examples of improving an original in intelligent ways, while maintaining the essence of what made it so good to begin with. It’s one of the few games which manages to excel in single-player, multiplayer and cooperative, making it a master of all trades. The new weapons are great, the gameplay tweaks are welcome and the storytelling is superb. While the first game bucked the trend, the second one elevated it to near-perfection.